Whether you are travelling for the Thanksgiving holiday or you’re living abroad and won’t be able to get on a quick flight back home to eat turkey and stuffing, spending a holiday like Thanksgiving away from home can be a little bit of an adjustment especially if it’s your first holiday away. Granted, when I spent Thanksgiving in Madrid last year, November 24th was treated like any other day, which didn’t make this day as hard as I thought it would be. 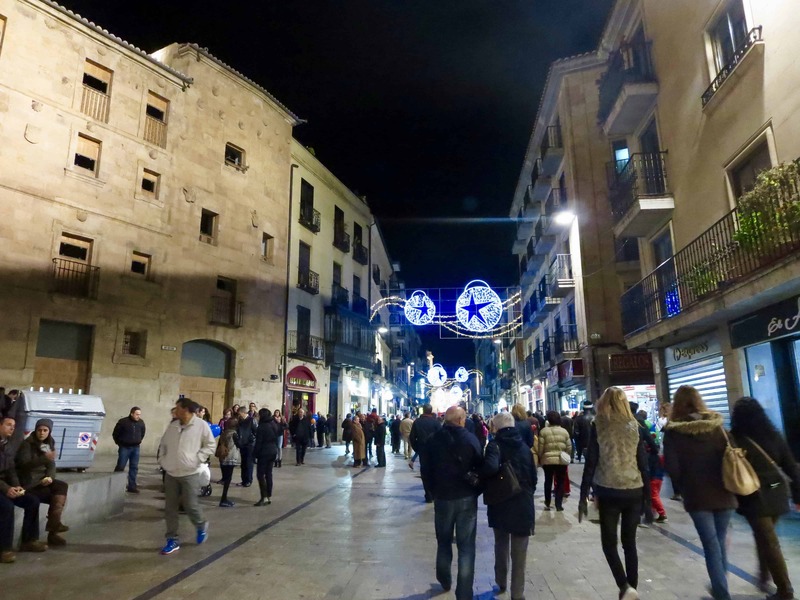 Mainly during this time in the year, in Madrid at least, people are starting to get into the Christmas spirit, and it is shown all over the sparkling and twinkling city at night. However, I think it’s interesting to see what a couple of friends, a little ingredient scavenger hunt, and someone’s oven can create in the name of a Thanksgiving dinner. 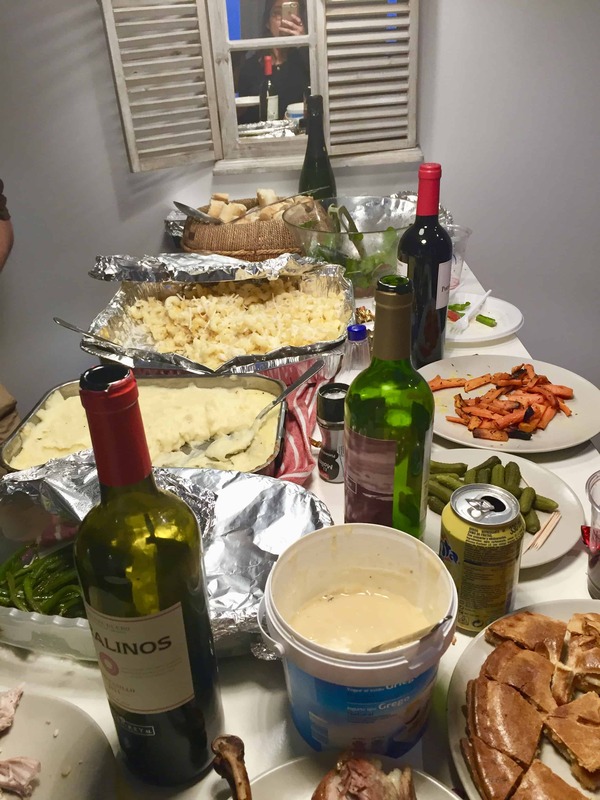 So keep reading if you’re interested in how Americans do Thanksgiving abroad! Just like with any other holiday and some people not being home to celebrate with their families, there are definitely things that people can do to either celebrate the holiday with others, or do their own thing and have another different experience. I think more than anything, holidays spent either alone or apart from family should be taken as experiences, rather than lamenting the fact that we will not be home. I think it’s an opportunity to be taken to have a different way of celebrating a holiday that chances are has always been spent with family in a traditional way at home. At my house, we always gathered with my aunts, uncles, and my cousins and some people made classic turkey and stuffing, while others made tamales or tacos. It was a Mexican-American fusion at my house, depending who was hosting. 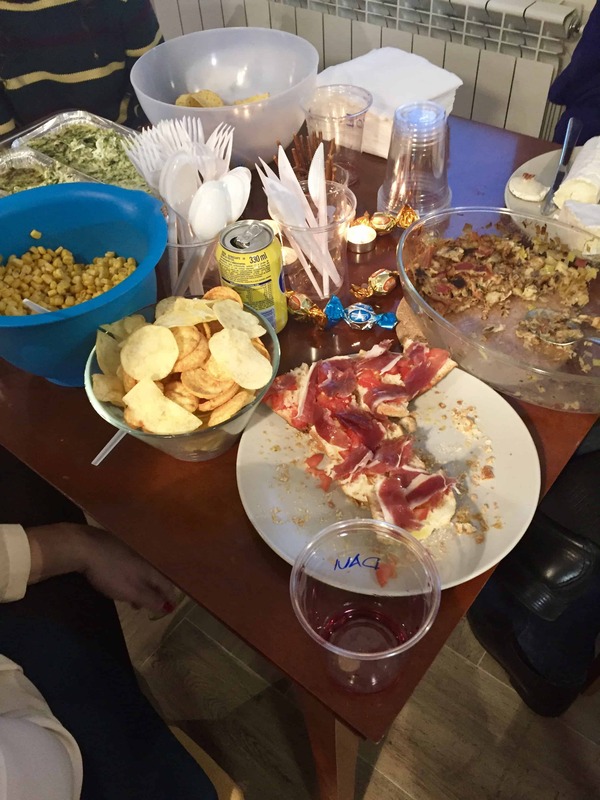 Last year however, since I was teaching English in Madrid and I was the only Mexican-American in my group of friends, there wasn’t much of a Mexican fusion, but we did end up having our own Spanish-infused Friendsgiving nonetheless! In preparation for this meal, we searched and searched firstly if we could get ahold of a store that sold turkeys (which side note we did, and they were fresh turkeys with feathers still attached around the feet…). We created a list and decided who was bringing what mostly based on recipe simplicity and ingredient availability. Madrid is such a diverse city with so many stores offering different and ethnic ingredients, including American ingredients. El Corte Inglés has well stocked grocery stores inside their department stores with huge variety in ingredients, but in terms of spices like nutmeg, or more specific American brands, Taste of America (yes that’s exactly what it’s called) is the place to go in the city center of Madrid. I made macaroni and cheese and green beans, while others made the turkey, mashed potatoes, sweet potatoes, corn, and creamed spinach: simple, traditional, delicious. It was an experience I will never forget, and it’s one also that I think about how different yet similar it was to how I would have typically celebrated at home with family. It was similar in the sense that this was a celebration with a close network of people who decided to come together and celebrate this American holiday with each other (turkey and everything). It was slightly unique and different in the sense that it wasn’t just all Americans who were in attendance, we also had friends that brought their Spanish roommates, or friends within the program who were from other countries like Ireland and England and they brought other foods like jamón, cheese, and croquetas. It was also both exciting and interesting to share and describe this American holiday with others, and it created a different outlook and experience for me personally since I was being asked questions like why Americans celebrate Thanksgiving in the first place, why we eat turkey that day, what’s the significance of this holiday in America and other related questions. We went around the room sharing one thing that we were thankful for, for which I naturally went beyond just being grateful for one thing, so I chose three. Being able to celebrate a comfort holiday with other fellow Americans, in a land so far away from ours. I truly felt like we were lucky to experience Thanksgiving like this. If you find yourself in this same boat during the holidays, don’t fret or think you are alone because you aren’t! First off, if you are studying abroad, it’s easier to feel accompanied with your fellow classmates and you can even go searching for restaurants in your local area that serve turkey or a restaurant that offers some type of Thanksgiving meal (I know Madrid had a few restaurants that offered Thanksgiving meals). Depending on the country you may find yourself in, and if you and your classmates have the time and the patience, you could even cook your own version of Thanksgiving with typical dishes and adding a twist to it by adding some local dishes or ingredients. If you end up finding yourself either living abroad or teaching english abroad like I was, check Facebook groups like “Americans in _______(host country)” where other fellow Americans may also be in your area, and in the holiday seasons may host gatherings and invite people to join. Hopefully you have found this post helpful and/or interesting! If you are going to be spending Thanksgiving for the first time out of the U.S and if you may be dreading it a bit, I encourage you to shift your perspective a bit and look at it as a different experience. Think about the years before and how you would typically spend Thanksgiving with your family. Then think about how unique and different this one can be, and just take it as another experience and a memory that you will share about in the future with friends and family. So if you decide to participate in celebrating this holiday abroad by finding a restaurant that is serving a type of Thanksgiving meal, or if you end up at a friendsgiving and you are cooking up a turkey (or small chicken), it’s a different experience that will definitely stand out amongst the previous years that you spent in America and at home. It doesn’t have to be lonely, it can be pretty cool. Please let me know in the comments below if you have celebrated Thanksgiving out of the U.S before, and what you ended up doing. I’d love to know!! Also share your your best tips on how to make the most out of spending a holiday without your family. Happy Thanksgiving para vosotros! Make it happen wherever you are.